The Gamer Xtreme Desktop Computer from CyberPowerPC is built for both work and play. Specs-wise, it's equipped with a 2.9 GHz Intel Core i5-9400F six-core processor, 8GB of DDR4 RAM, a 500GB NVMe PCIe SSD, and an NVIDIA GeForce GTX 1660 graphics card. With these combined, this system can easily tackle everyday tasks such as browsing the internet, composing and editing documents, and even playing popular eSports titles at a Full HD resolution. Other integrated features include DVI, HDMI, and DisplayPort outputs, Gigabit Ethernet, 802.11ac Wi-Fi, multiple USB ports, and audio in/out jacks. The operating system installed is Windows 10 Home and it comes with a gaming USB keyboard and mouse so you can get started as soon as possible. This system is built within a CyberPower Onyxia mid-tower case and has a 600-watt power supply. 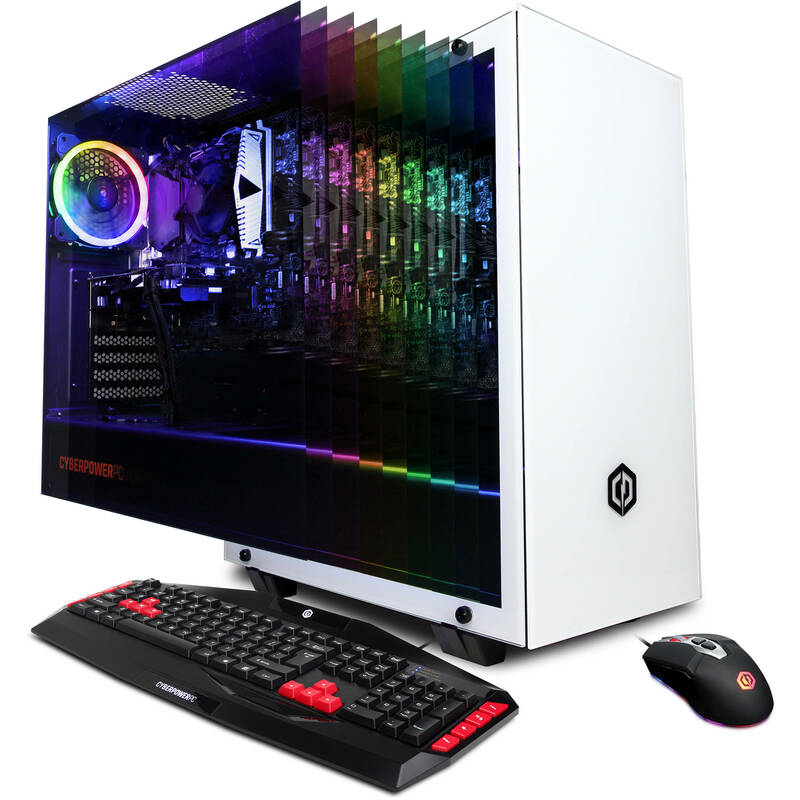 Moreover, it features a tempered-glass side panel and custom RGB lighting. If you're going to play online multiplayer games, you'll need a faster internet connection. This CyberPowerPC desktop computer offers 802.11ac Wi-Fi as well as a Gigabit Ethernet RJ-45 LAN jack so you'll be able to have fast, wired or wireless internet access. Included are a USB RGB gaming keyboard and mouse so you can start gaming as soon as you set up your computer. All you need is a monitor (sold separately). This represents the graphics card's minimum number of ports. Connectivity may vary depending on manufacturer stock at time of production. Box Dimensions (LxWxH) 22.0 x 22.0 x 12.9"